I imagine it quite an honor to be compared with the great Simenon, who wrote 75 books and 28 short stories featuring Maigret. Vargas has her own style, however, for almost all her police characters outside of Adamsberg are capable and independent, with unique identities. I don’t ever remember Maigret’s coworkers standing out, though his wife is always an important influence and character. In this way, perhaps the iconic Swedish series of ten mysteries by Maj Swojall and Per Wahloo featuring Martin Beck may be a better model. 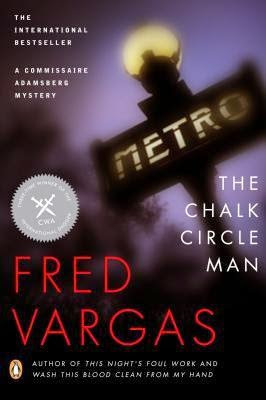 So The Chalk Circle Man is the first book in the series, but was not the first to be translated into English. Publishers sometimes do this, and readers often can’t comprehend why. Perhaps later books in the series seem more accessible—authors may improve their technique as they go along and the publishers are trying to capture an audience with just one book in the series. In any case, I’d not heard of this author until five of the now eight books in the series are available in English, so I began at the beginning. So much has been written about the precociousness of 25-year-old Téa Obreht, the author of The Tiger’s Wife, one could not help but be curious to see/hear the work she had produced. I listened to the audio, beautifully performed by Susan Duerden and Robin Sachs. Obreht has created an old, deeply carved, overstuffed wooden box of delights with this novel. As she slowly opens it for us, we expect perhaps to hear tinkling music but instead with are struck with the slightly pungent smell of time gone by, dried herbs, and something musky and mysterious and animal. Obreht has stories upon stories within stories…she mines a deep, rich folklore and an oral history passed between family members and among townspeople. In this tradition, everything becomes a story to be embellished and told at length—going nowhere in particular—leaving one hanging on the central mystery of it all. We listen as though to a ghost story, doom and foreboding swirling through the telling. We never know what daily event will trigger a long, circuitous explanation that will bring us to recall the local village’s history with strange characters and remarkable beasts. In an interview, Téa Obreht explained she moved frequently as a child, making friends and leaving them, spending a lot of time alone thinking about herself, her life, her family, and her history, almost to the point of unsociability. But it gave her the time to watch and notice and create sentences which describe locust in a nighttime graveyard: “the sound of the cicadas comes in waves,” starting slow and rising high, crashing to a deafening silence, only to rise again a minute later. But who was the Tiger’s Wife? We know she was a deaf mute who died a cruel and needless death, as many did these past years in the Balkans, distrusted by neighbors and sabotaged by family. Was she a symbol of unruly passion and wild nature that is essentially good but misunderstood? She lived many years side by side with husband and neighbors with no ill effects, but fear conquered rational thought in most folks—that dark folklore again—which led townspeople to ostracize her. The startling and unforgettable description of her hissing at someone, her nose wrinkled and flat to her face, was as clear as a drawing on a page: With her whole body shaking, “she hissed and her teeth flashed out, and the ridge of her nose folded up against her eyes. The sound, the only sound he had ever heard her make, left him quaking. The first sound she’d ever made was not human." I found myself happy to leave that darkly suspicious town, so used to indignities and pain that they would thoughtlessly inflict the same on anyone who threatened their unstable peace and burdened lives. We never learn what happens to the Deathless Man…one is always expecting him to show up again in a later incarnation, asking for water. Even Natalia, our narrator, urgently questions the last people to notice her grandfather before he died, asking them if he was seen speaking with a man that fits the description of Gavo, the Deathless Man. But we learn the fate of the animals from the zoo, we learn of the desperation lived by city folks bearing daily shelling, we learn of the reversion to storytelling and folklore when rational explanations no longer make any sense at all. This novel deserves all the kudos heaped upon it. The clarity of the writing, the construction of the central mystery, the steady buildup of tension, the detailed character development—all are remarkable and accomplished. The story is simple and straightforward, but becomes nail-bitingly tense as the cub reporter Rufus pursues the kidnappers of a woman on the Nigerian delta. Rufus wouldn’t have volunteered for the dangerous mission but for wishing to accompany a veteran reporter he admires, Zak. Things go wrong. One senses the dark nights, the hot, greasy air creased with yellow torches flaming high from the oil rigs, and a maelstrom of humanity wielding guns. Oil permeates everything—the air, the water, the soil—and oil brings wealth to some and homelessness to many in Nigeria. Rufus is both the first and last name of our narrator, a single name he adopts just like Zak, the reporter he most admired. Zak is alcoholic, broken in body and disillusioned, but he is still a raging intellect with the heart of a lion. These two men, on their journey to find the kidnapped wife of a British oil engineer, run into militants seeking adequate reimbursement for oil revenues passing them by. Soldiers seek to stymie the kidnapping plot. Rufus and Zak witness the aftermath of their battle. Rufus is a photographer first, and his experience allows him to take pictures that grip the eye. Habila was a journalist first. He knows how to write a sentence that makes a picture. The simplicity of the writing gives us immediate access to his story: a few words show us the timbre of a voice, the stiffness of a back, the roll and gloss of an eye. On Habila's website we are treated to a blurb from celebrated British author Jim Crace who says, 'Helon Habila writes with intelligence and admirable narrative economy.' That's it, of course. There is no waste. In addition, Habila makes all his characters vulnerable, even the oilmen, the kidnappers, and their henchmen. He takes seemingly incomprehensible events and shows them from every angle, surprising us with their simplicity and their pathos. He reveals terrifying truths and exhibits the almost endless resilience of people under unbearable pressures. He shows us humanity as depraved and as generous as we know ourselves to be. At first I was a little taken aback that this book was not written in the voice of Lady Duff Gordon, on whose letters this novel was based. I thought I might prefer the voice of the woman whose entrance into a room made the party brighter, suddenly more fashionable, very au courant. Lady Duff Gordon suffered from a malady of the lungs, which required a warm, dry climate rather than that of England at the turn of the 20th century. She left her family and moved to Egypt with her lady’s maid and spent the bulk of her time in Luxor, home of the tombs of the pharaohs and the Sphinx. She enjoyed a wide circle of friends among the local intelligentsia. Little was recorded of her lady’s maid, Sally Naldrett, but this is a novel told in her voice—how first Lady Gordon shed her English clothing and mannerisms, and then Sally did. How they both became acclimatized to life in Egypt, learned Arabic, and how Sally felt she had shed her old, lonely maid’s life for a life both warm and passionate. How she outgrew her position of servility alone, and became a woman on her own terms. The story is lightly and quickly told, but develops an urgency in its later pages that belies the sunny outlook of its beginning. In writing this novel, Kate Pullinger drew on biography of Gordon written by Katherine Frank, called Lucie Duff Gordon: A Passage to Egypt, published by Houghton Mifflin Harcourt in 1995. Pullinger reviews it here. The biography was republished in 2007 by Tauris Parke Paperbacks and is said to show the sparkling nature of the vivacious Lady Gordon. A darker side of that character is hinted at in this novel, leaving lingering questions about a widely admired woman whose family shunned her, and who shunned others, brutally and unforgivably, in return. One is eager to turn to the original materials to get to the heart of the matter. One feels sure there is still a novel in the material there, this time from the view of Lady Duff Gordon (1821-1869), whom even the Prince and Princess of Wales came to visit in Luxor when she was too ill to travel. This is a small, pocket-sized book which can transport you to places far off and long ago, and for that, it is amply worth the time and expense of acquiring it. Later, when I was looking through Kate Pullinger's website, I came across a blogpost speaking of Ellen, Sally Naldrett's sister, who makes an appearance in the book. It gives one tingles to think that rich lives went unrecorded and unremembered until now. Robin Wright may be the Middle East analyst with the most access—she seems to travel unhindered whenever and wherever she chooses to visit. Wright so clearly loves the Middle East, and Iran in particular, that we begin to love it, too. We especially love the brave men and women who risk their lives to demand a voice, in Iran and Syria for example. The demand for civil rights for blacks, perhaps, is the last time we have seen peaceful resistance and a stand on righteousness in this country. It can be violent, but it is extraordinarily effective. In this book, written for a non-specialist in Middle East politics, Wright introduces us simply, clearly to the major players, excluding Israel. She writes of modern Arab history, beginning with The Palestinians, moving to Egypt, Lebanon, Syria, Iran, and Morocco. We are given major, still-relevant events in recent history for each group, and interviews with both government and dissident voices. The lines of dissension couldn’t be clearer, and though the Israel/Palestine divide is rarely mentioned after the first sections, this is the context within which all the Middle East labors. Besides that, each country has its own particular geography and political history to enter the equations for peace and stability. A throwing off of long-governing autocrats doesn’t seem impossible: Wright makes it seem inevitable. Which makes one wonder, “why can’t the leaders see that?” Does she make it too simple for us? Certainly her descriptions make me want to go to the Middle East myself, to see for myself, if only it were that easy. If I have to rely on someone else’s interpretation, hers seems as balanced as one can hope for—if she weren’t balanced, she wouldn’t have the access she exhibits. Change in today’s Middle East is likely to succeed only when all major players—not just the majority—believe they have a stake in the new order. Rival identities will otherwise derail it. The sense of common nationhood is still too fragile. Suspicions run too deep. ..Iraq is a telling, and tragic precedent. Robin Wright is publishing a new book this July with Simon and Schuster called Rock the Cabash: Rage and Rebellion Across the Islamic World. I look forward to seeing it. Don’t miss it! The photographs in this book are really gorgeous and have a certain indefinable quality (of light?) that makes one think of the West Coast. But it is the ingredient lists that give one the certainty that this book was not written nor conceived on the East Coast. The Asian-inspired (Japanese-style, really) recipes do not hail from New England, where we have far less Japanese influence on our food, to our detriment. The Mustard Maple Tempeh marinade is a total win. It would be good with anything, but I took the author’s suggestion and put it on a green salad dressed with Orange Tahini Dressing, which was also simple and yummy. The Veggie Frittata topped with roasted asparagus was less successful. The asparagus was great! I was so excited to try this, and so disappointed by the result. The chickpea flour flavor was strong, and the tofu too unusual a texture. I could never get away with serving this to non-vegans. A very similar recipe appears in Isa Chandra Moskowitz’s Vegan Brunch, but without the chickpea flour, and Isa's version is a clear hands-down winner to my taste. However, Isa’s omelet in the same book is made with ½ cup chickpea flour, so it clearly is texture that both authors are attempting to recreate. I didn't try Isa's omelet to see if the taste was the same. Ann Gentry chose well in her sweets chapter. These are classic sweets that go down well, and they’re NOT ALL CHOCOLATE. My mind tends to equate good sweets with chocolate, so that is my failing. But the Almond-Jam Thumbprints and Date Bars, made with her own flour concoction, are classic. (I do tend to balk at the large amount of maple syrup in the recipes, though. Even here in New England, where we revere our Maple Syrup, it is expensive, and not something one can easily countenance for a batch of cookies.) The Chocolate Silk Pie I can attest is way better than you imagine it will be. Overall, this is a strong collection with surefire classics in each chapter. This genre-smashing ripping great yarn is simultaneously a mystery, a romance, and a dash of science fiction, as portions of it take place, rather daringly I thought, in the future. Set 300 miles northwest of London in the mountainous Cumbrian region of England, the location itself gives a cold, hard, craggy feel to the formative youth of our hero. His return, in later years, to this rugged place for the dénouement makes a pleasing symmetry that reinforces the chill we feel when contemplating the brutality of his life. Our hero is born of a woodcutter, falls in love with the squire’s daughter, and seeks to breach the obstacles that separate their lives. It may be that romance is never far from the heart of a successful mystery, and it appears to be so in this case. But the swiftness with which we are entangled in the events which overtake our hero is due entirely to the prurient nature of the allegations, the documented and well-known love of readers for trashy sensationalism, and the exceptionally practiced skill of the author. Author Reginald Hill, widely adored for his long-running Dalziel and Pascoe series, always has a strong sense of character and place in his novels. In this stand-alone mystery, he surpasses himself in presenting a tightly woven narrative from various points of view, with shifting time frames, pacing, and locales. And throughout he manages to preserve the essential humanity (and therefore goodness) of even his wickedest assassin (except, perhaps, Ni-KEE-tin). This earns the characters, despite their failings, our interest, our understanding, and ultimately, our forgiveness. If the author strays occasionally into hyperbole to drive home…an axe, a prick, a character trait...well, we forgive him, too. This book will be available in stores August 1, 2011 -- so put it on your reading list and buy it for the waning days of summer. You'll love it! Hill's official website is a limited affair, but worth perusal. Three Seconds by Anders Roslund, Börge Hellström, translated by Kari Dickson. I reviewed this book last month. Tibet Underground 1939(?) by Jinzo Nomoto, or maybe it was Japanese Agent in Tibet by Hisao Kimura. He wasn't sure, but it sounded great! My recommendation is a brand-new (comes out August 1, 2011) genre-smashing, wildly good stand-alone Reginald Hill called The Woodcutter. Put it on your lists so you don't forget--you'll love it! I love just about everything about this book. I love the way it looks. I love the descriptions of the vegetables. I love that other people are cooking with and eating things I’ve never encountered before. I love that the vegetables are centered on common ones that grow well in all areas of North America. I love that any one of the recipes could be served to guests. When one has grown or purchased fine expensive local produce (and it is expensive in time if not money if you grow it yourself)it is so nice to have a recipe which doesn’t obscure the color, flavor, texture of the vegetable, but makes it sublime. I love that many of the vegetables and herbs are discussed in detail, including their season of ripening, so you know when to expect the harvest to grace your kitchen. And the original lino-cuts of the vegetables are not to be missed. You simply MUST see this book, even if you have to visit your local bookstore to do so. The lino-cuts are exquisite full-color drawings of each vegetable with its unique characteristics. You may decide to try something new for your family when you’ve seen this lovely tome. One gift deserves another. The book is so beautiful I hate to bring it into the kitchen. And it saddens me that the vegetables must be pulled from the garden THAT DAY to be used in these simple veggie-centered meals. If you have an abundant garden, or live close by a farmer’s market with innovative vegetable choices, you may survive. But you simply cannot expect to use supermarket groceries for these recipes and expect them to taste like they would in Alice Waters’ restaurant, the Chez Panisse. The simpler a recipe it is, the more difficult it can be: for instance, “a drizzle of olive oil” really requires the best olive oil if that is the only dressing. And one must have infinite experience to make a simple meal: sautéing must have the proper proportion of oil at the correct temperature for the proper amount of time—this is all experience—no recipe can tell you when it is right for your ingredients. And–horrors—I often don’t follow a recipe EXACTLY because of ingredients or amounts on hand. The recipes in this book really work better when you follow the directions within reason. I have much more respect for those chefs that make simple, beautiful, flavorful meals and know why they are so expensive. Less is often more. But every year I tell people about the first time I tried Alice’s suggestion at a dinner party: tiny baby hakuri with greens attached laid in a tiny amount of boiling water in a large saucepan for a short time until greens are bright green and bulbs slightly softened. That’s it—and it will change the way you view turnips, and vegetables in general. It’s beautiful, soul-satisfying, simple, and fresh. There was also a time I used 1-lb of kale, 2-lbs of spinach, and 1 large head of escarole in one dish feeding six people. It cooked down to perfect portions! Now that farmer’s market and local produce is popular again, do yourself a favor and see this book. You may want to treat yourself. This is the way rich people eat. When the publishing industry is in decline and our expectation of instant gratification makes TV and the internet our primary sources for news, one would have to ask oneself: is this the best time to publish a new book on the philosophy of a discursive French essayist who died over 400 years ago? 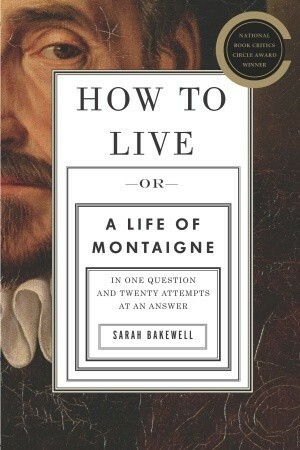 Of course, the answer would have to be “it depends.” Sarah Bakewell has managed to make Michel de Montaigne seem relevant, perhaps even revolutionary, but certainly eminently likeable. Montaigne would have been an exceedingly popular blogger, for he took incidents of daily life and held them up for examination, and used them as stepping stones to rambling narrative. He inspired loyal devotees, as well as provoked and enjoyed passionate rebuttal. “No propositions astonish me, no belief offends me, whatever contrast it offers with my own.” One could argue endlessly, happily, and doubtlessly profitably with such a man. For twenty years, from ages 38 to 59, he stayed mainly at his estate in the Bordeaux region along the Dordogne River, and wrote essays. He came close to death in a riding accident, weathered various occurrences of plague (though the love of a lifetime, La Boétie, was taken), and was victim of various ailments that could have been alleviated today but which eventually killed him. Importantly, he lived through the period of time known as The Saint Bartholomew Wars, which was recently cited in a book on modern counter-insurgency as an example of one of the longest and most consequential non-state religion-based internecine conflicts characterized by extreme violence, bloodshed and carnage: Catholics on Protestants. It led Montaigne to write, “There is no hostility that exceeds Christian hostility.” And yet Montaigne managed to maintain a sense of proportion and breadth of perspective that seems positively Zen in this day and age. He was liked and admired, was elected mayor of his village without seeking office, his writings were collected by the king and twittered over in the boudoirs of all France. But I haven’t yet said what it is about this book that makes me convinced there is no better time to introduce Montaigne into the mainstream. It is Sarah Bakewell’s handling of the material, in which she proves herself a fascinating conversationalist and careful historian. In lesser hands, the material could have seemed distant at best. But Bakewell allows Montaigne himself to shine: his work seems as amusing and fresh as a friend declaiming over a glass of wine—red wine, white wine—you never know with Michel. I haven’t yet read Montaigne’s Essays, but I certainly intend to now. It seems a pity to leave Montaigne to experts. More than that, who couldn’t use a clever best friend? I relished the background and erudition Bakewell brought to the picnic. Every page was a delight.